Beyond Ramen: Happy birthday, America! I hope that everyone has had a happy, safe, festive Fourth--and one full of good food, at that. I spent lunch with my extended family over in Santa Cruz--taking some brownies and chocolate crinkle cookies with me--and returned home to make another mess in the kitchen. First up, a berry tart, then some pesto potato salad with green beans, then some lemony herb chicken on the grill. We took the potato salad, the chicken, and some of last night's spicy buttered corn and had a picnic at a nearby park. The tart was for my parents, both as a "happy Fourth!" gift and in belated thanks for my mom's taking care of the kittehs while the Suitor and I were on travel in Boulder. The strawberries and blackberries are from my CSA share. The crust is a fascinating recipe that I have been meaning to write up and post, so I'll save that for later. 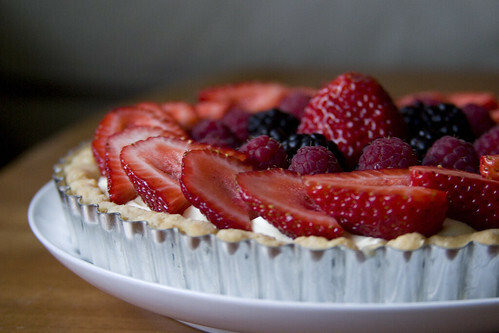 The filling underneath the berries is a lemon- and vanilla-scented pastry cream lightened by a bit of whipped cream. It is, though I say it myself, a perfect summer dessert. Our dessert... well, I'll say nothing about it at the moment, save that it's something inspired by my trip to Scotland. Guesses, anyone? Oh those berries look absolutely heavenly!! What exquisite colors!! BBQ food is my absolute fave. I was salivating at the mere description of your picnic. Thanks! 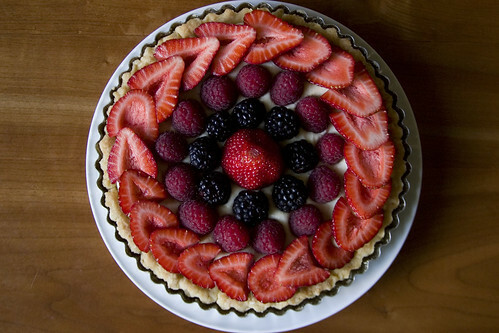 They were excellent berries, all I had to do was put them on the tart. :) Isn't BBQ food great? Especially when you can eat it out on a great big grassy space.